Hunger and eating patterns are metabolically controlled and modulated by a neural system that interacts with the environment. From an evolutionary perspective, securing adequate fat intake, storage and utilization is of paramount importance for survival. As reported recently by Rebello et al (2), by generating neuronal and endocrine feedback signals, behavior and metabolism can adapt to changes in food availability. In modern society, however, foods of all sorts are easy to procure, particularly those that are rich in carbohydrates and fat. Many of these foods are clearly appealing and pleasurable and their consumption results in the stimulation of the so called “reward pathways” in the brain, leading to overeating. Rebello et al indicate that “these foods can activate brain reward circuitry beyond their evolved ‘survival advantage’ limits”, which may, in turn, result in stimulating their procurement and consumption. Despite the potential harm of excess fat intake, dietary fat has the ability of inducing signals in the gut that are transmitted to the brain and have a major role in the regulation of appetite. As reviewed by Rebello et al (2) “fatty acids are sensed by G-protein-coupled receptors on entero-endocrine cells, which trigger the release of peptides involved in appetite regulation”. Fat may activate several metabolic pathways that prevent ‘overeating’. The concept that prolonging the presence of fat in the intestinal lumen allows appetite suppression has resulted in the development of ‘nutraceuticals’ which may be useful for appetite control. Thylakoids, found within the chloroplasts of plants, have been shown to interact with lipids and delay fat digestion. Moreover, thylakoid membranes promote the release of peptides involved in appetite regulation. Putting this in simple words, one of the problems with currently available processed food is that due to its composition, it overwhelms the satiety system in such a way that the hormones in the gut that send satiety signals to the brain and suppress cravings cannot keep up with the excessive demand. Thylakoids slow down the digestion process, giving the intestinal hormones enough time to convey satiety messages to the brain. In a small but important study, Montelius et al (1) assessed whether green-plant membranes, known to reduce hunger and generate satiety signals, could help reducing body weight when administered long-term. They assessed 38 women -40-65 years of age, with a body mass index 25-33 kg/m- who were randomized to receive dietary supplementation with either green-plant membranes (5 g) or placebo, given once daily before breakfast for 12 weeks. All individuals were instructed to follow a three-meal a day scheme and to increase their physical activity. Women receiving green-plant membranes lost more body weight than those on placebo (p < 0.01); 5.0 ± 2.3 kg compared to 3.5 ± 2.3 kg in the control group. 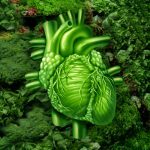 Consumption of green-plant membranes also significantly reduced total cholesterol and LDL-cholesterol (p < 0.01 and p < 0.05 respectively). The study also showed an increased postprandial release of glucagon-like peptide 1 (GLP-1) and decreased urge for sweet and chocolate. Reductions in waist circumference, body fat and leptin were not different between the groups. The authors concluded that addition of green-plant membranes as a dietary supplement once daily “induces weight loss, improves obesity-related risk-factors, and reduces the urge for palatable food. The mechanism may reside in the observed increased release of GLP-1”. Thus acting on satiety pathways and suppressing ‘hedonic hunger’, as opposed to ‘homeostatic hunger’ that helps covering the individual’s basic energy needs, may be a useful adjunct in weight reduction strategies. These findings –if confirmed in larger studies- may provide a new weapon to combat the serious, currently ongoing, obesity epidemics. Montelius C, et al. Body weight loss, reduced urge for palatable food and increased release of GLP-1 through daily supplementation with green-plant membranes for three months in overweight women. Appetite. 2014;81:295-304. doi: 10.1016/j.appet.2014.06.101. Epub 2014 Jun 30.